Over 22 million Americans are struggling with substance abuse or addiction. It’s becoming more and more evident that we are facing a serious epidemic. Aside from the emotional and physical hardship, addiction is also generating massive costs. The government spends over $484 billion annually in treating and assisting addicts and their families. The problem is that, without a long-term plan in place, most addicts relapse and are unable to break out of the vicious circle. Although conventional therapies are effective in targeting the illness in the early stages of recovery, alternative ones could help patients continue with their treatment plan and maintain the positive behavior. Yoga therapy is such an option. Yoga is an ancient technique that uses physical postures and controlled breathing to improve one’s mental state and help them relax. Due to the impact, this practice has on a person’s well-being, it can aid patients in achieving a better sense of control over their addiction, especially during intense craving episodes. According to one review, using yoga and meditation has promising clinical efficiency as a complementary addiction therapy method. Because it’s a rather unconventional discipline, the medical community has been a bit hesitant about incorporating this practice into their treatment plans. However, with more and more studies pointing to its effectiveness, rehabilitation centers are beginning to recommend yoga therapy as part of a more holistic recovery plan that tackles both the physical and mental, and emotional effects of substance abuse. What Other Therapies Are Often Used in Conjunction with Yoga Therapy? Yoga on its own can help patients heal their addiction. Medical assistance and conventional therapies are essential components of a successful recovery. However, by pairing yoga with other treatment options, patients have a better chance of overcoming their addiction. Through yoga therapy, for instance, patients can learn how to control their negative emotions, enter a meditative state, and face temptations. Yoga can also give them a new outlook on life and help them face difficult situations with calm and ease. The growing number of studies and evidence makes it clear that yoga can be an excellent addition to an addiction treatment plan. Rehab centers should take advantage of the benefits offered by this alternative therapy and include it in their plans. Windward Way actively makes use of holistic approaches to substance abuse treatment like massage, acupressure, tai chi and yoga, because we are committed to opening our treatment to new options for men. 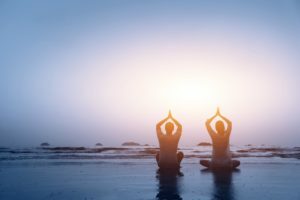 The addiction treatment plan we can develop for your drug rehab or alcohol treatment program may fit yoga therapy into your customized treatment regimen to help you find a new way to relax and center your mind. The truth is our yoga master may even help you discover the ability to finally grasp true mindfulness and create for yourself a new, centered focus to achieve your life’s goals. Yoga therapy can also become the gift that keeps on giving for men who want to find an alternative to drugs or alcohol. In fact, many of our alumni have incorporated a practice of yoga into their daily routines. The transformations we’ve witnessed firsthand in the men we’ve helped are real — Windward Way prides itself in having brought success to so many men. The same can be true for you as well. Since our treatment center draws from not only traditional addiction treatment methods, but also from the more innovative and exotic wisdom from the East such as yoga, our addiction treatment program offers more options than many other programs. The honest truth is that we can help you deal with your problem of abusing drugs or alcohol like no other. We’ll be only too happy to answer the questions that you may have about yoga therapy or any other of the many treatment therapies our staff uses. We’re ready now to develop a program, custom fit just for you. The only risk you have is in not calling us and letting your problem remain the same. Call now at 855-491-7694 and hear for yourself about all the men we’ve helped at Windward Way.